In this level-one story, Princess Emma runs around the castle making sure everything is perfect for the Spring Tea. She tries to tell the baker how to make the cake. She refolds the napkins. And she shoos Kitty out of the way. When her friends arrive, she learns that only God is perfect, and the point of the day is to enjoy her friends. This level-one story teaches girls what it means to be a princess for the true King. 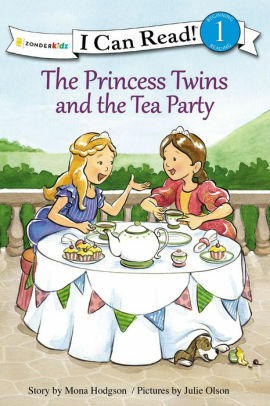 The Princess Twins and the Tea Party is A Lesson in Humility, especially appeals to ages 4-7. Beginning Reading, Level 1. Simple sentences for eager new readers. “After a great experience reviewing The Princess Twins and the Birthday Party, I opted to get The Princess Twins and the Tea Party as well. In this story, Princess Emma is trying to make sure that every detail is ready and perfect for the tea party. She works so hard, striving in every possible area to be perfect, and is then reminded that only God is perfect. What a great truth! Our daughter Maddy, nearly 4 years old and into princess-everything, was in love with this book. I’m pretty sure we read it at least 3-4 times as soon as it was opened. I don’t know that she quite comprehends the message of striving for perfection, but the story creates wonderful avenues for conversation on the topic.